Trump claims that U.S. missile defense works 97 percent of the time. It doesn’t. Trump claims that U.S. missile defense works 97 percent of the time. It doesn’t, and it’s a problem if he thinks that. 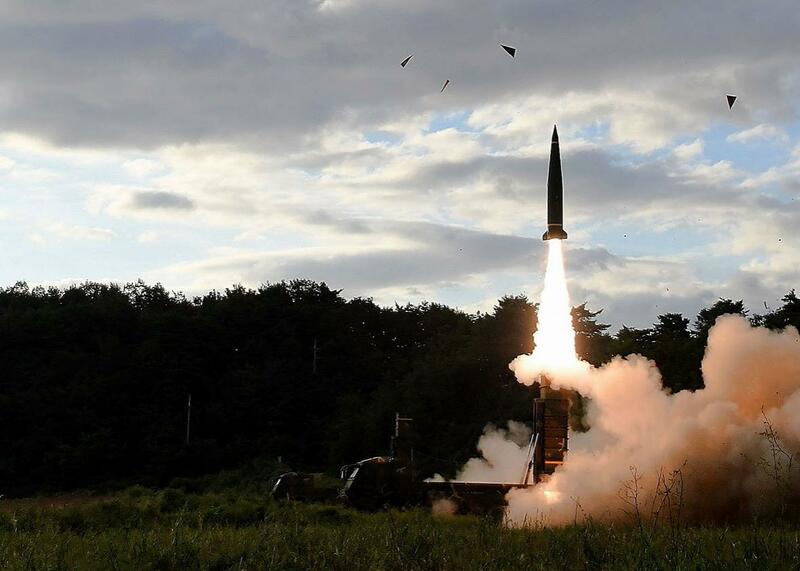 In this handout photo released by the South Korean Defense Ministry, a Hyunmoo-2 missile is test-fired into the East Sea on Sept. 15 during a drill aimed to counter North Korea’s missile fires. Trump was speaking of our missile-defense system and how easily it could shoot down North Korean nuclear missiles as they dart through the sky toward their targets. Two things need to be said about this. First, Trump is wrong. Not even the program’s most avid boosters have ever made a claim quite this optimistic. Second, someone needs to tell Trump he’s wrong, because if he believes what he said, he might think that he could attack North Korea with impunity. After all, if the North Koreans retaliated by firing their nuclear missiles back at us or our allies, we could shoot them down. Here’s the problem. The United States has spent hundreds of billions of dollars developing, testing, and fielding ballistic-missile-defense systems over the past few decades. But in tests, these systems hit their target only about 50 to 60 percent of the time. And even this record exaggerates how they would likely perform in an actual conflict. In the tests, everyone involved knows ahead of time when, where, and at what angle the missile will be launched. Also, with only a couple of exceptions, the tests have aimed an interceptor against just a single target—whereas, in a real war, the attacker would almost certainly fire a volley of missiles. The real attack might even happen at night, whereas all of the tests have been conducted in daytime. Some have suggested that the next time North Korea tests a missile, we should shoot it down. The test numbers hint at why the Pentagon is hesitant to take up this idea. It would look very bad if we missed—and there’s as good a chance as not that we would miss. One could argue that the missile-defense systems play some role in deterring North Korea (or some other hostile country) from launching an attack. Maybe. Kim Jong-un might think it’s possible the U.S. would shoot down one of his missiles. But if we failed at shooting down even one of them, the program’s deterrent value would shrink to nil; even if our systems were really good and the failure had been a fluke, this first impression would be the one that sticks. It might even embolden Kim in his nuclear ambitions. Or, Kim could just compensate by firing more missiles, thus heightening the chance that some of them would get through. And if the interceptors didn’t work, then those extra missiles would wreak more damage still on the country where they exploded. It was for this reason—the fact that the offense could easily outrace the defense, and much more cheaply—that the United States and the Soviet Union signed the Anti-Ballistic Missile Treaty in 1972, prohibiting the deployment of ABM systems (and thus requiring the dismantlement of rather extensive, but utterly ineffective, systems that had been developed and, to some degree deployed, over the previous 15 years). By the late 1990s, Republicans were campaigning on fulfilling Reagan’s promise. When George W. Bush entered the White House in 2001, he announced that the United States was pulling out of the ABM Treaty—which an article of the treaty allowed with six months notice—so that he could actually start fielding anti-missile missiles. One thing Bush did was to create a special Pentagon office—now known as the Missile Defense Agency—to manage these programs. The congressional armed services committees settled on an annual MDA budget of roughly $10 billion, and so it remained, in a bipartisan consensus, even though the programs initially tested poorly and, after a couple of years, even Bush stopped talking about it. Today’s missile-defense systems operate very differently. As before, radars track the flight path of an incoming missile, but the rocket that’s launched toward the missile is carrying not an atom bomb but rather a “kill vehicle”—which destroys the missile by slamming into it. When first proposed, this seemed like a preposterous notion, akin to “hitting a bullet with a bullet.” But this is exactly what it does. On a purely technical level, it is a stunning achievement that it works even some of the time. But “some of the time” isn’t good enough for protecting a city from a nuclear missile, especially if the attacker can overwhelm the defense by simply firing an extra missile or firing the first missile from an unaccustomed angle or programming the missile to shoot out a cloud of chaff—metallic fragments—that confuse the radar, which might start following the chaff instead of the missile. It is not known whether the North Koreans have put chaff in their missiles, but it’s not that sophisticated. The U.S. and the USSR did this in the mid-1960s—the devices were known as “penetration aids”—and it’s conceivable that North Korea has obtained some crude ones from the Russians. In any case, the U.S. has not publicly conducted any tests to see whether the missile-defense radars can distinguish a missile from chaff. The United States has three basic types of anti-missile weapons: the SM-3s, fired from Aegis-class cruisers at sea (though a land-based version is in development); Terminal High Altitude Area Defense, or THAAD, which South Korea recently deployed; and the Ground-Based Interceptors, or GBIs, which are based in Alaska. THAAD has an excellent test record against short-range missiles, but it has only once been tested against medium-range missiles (those with a range of about 600 to 2,000 miles) and never against intermediate-range missiles (2,000 to 3,500 miles). So it could probably knock down a missile or two fired from North to South Korea. Could it hit a missile aimed at Guam? Unclear. SM-3s have a similar range, but the Aegis cruiser would have to be in the right place at the right time. According to John Pike, director of GlobalSecurity.org, the Aegis tests align the interceptor, the target-missile, and the point where the two collide along a straight line; when it’s fired from a side angle, it tends not to work. The Pentagon’s office of testing and evaluation gives these systems a mixed assessment, concluding in a recent report that they have demonstrated “a limited capability” to defend against “small numbers” of medium- and intermediate-range missiles—and “a fair capability” against short-range missiles. The GBI is the one system designed and tested to shoot down long-range missiles—for instance, those fired at the continental United States—and even this program’s defenders, when speaking privately, hem and haw about its success rate. It has shot down a target in 10 out of 18 tries since the program began in 1999, and it’s been tested just once since 2014. Think about those numbers. Here’s a program that is supposed to defend the nation from a nuclear attack—and (forget the mediocre success rate for a minute) it’s hardly been tested at all. But, again, 56 percent is almost certainly an overstatement, given the less-than-realistic nature of the tests. And, in any case, Trump misunderstood the number he was given—he told Hannity that the weapon could knock out a missile 97 percent of the time, meaning “if you could send two of them,” you’ll knock out the missile for sure. No, you need to fire four to bring it up to 97 percent—and you’d need six, not two, to get it to 99 percent. The U.S. currently has just 48 GBIs—meaning that, even if the system worked as well as the tests indicate, we would run out of interceptors after the North Koreans (or whatever foe) fired 12 missiles. The 13th missile would sail through with no interference. Why haven’t the missile-defense systems been tested in a realistic setting? Why haven’t they been tested much at all? A fair inference is that nobody in charge takes them very seriously; nobody is even pretending that they’ll play much of a role in an actual war. All the U.S. missile-defense programs combined have been tested just 93 times since 2001. If someone were taking them seriously, they’d be tested once a month. This is what happens when the government creates a special agency to solve a complex problem, gives it a boatload of money, but keeps it isolated from the more mainstream bureaucracy. It performs amazing technical feats—but only under circumstances that facilitate these feats. Around the time Bush abrogated the ABM Treaty and started deploying ABM systems for the first time in three decades, Congress exempted the Missile Defense Agency from the rigorous test-hurdles that most other weapons systems have to clear. There would be, for example, no war games in which a Blue Team would man the missile-defense system and a Red Team would try to trick, overwhelm, or otherwise defeat it. Most of the commanders in other parts of the military sort of know this, but they don’t talk about it much. There’s a mystique surrounding missile defense. It succeeds in helping deter an enemy attack only to the extent that the mystique is preserved. So the Missile Defense Agency doesn’t test the systems seriously. And the war commanders don’t talk about the subject much or integrate it into their own war games. It’s possible Trump knew what he was doing by reciting these numbers on television. Maybe he meant to thicken the mystique. The danger, and the more likely scenario, is that he took the numbers seriously, that he thinks this stuff really works and that it gives him a magic bullet in a war with North Korea—and that, therefore, he might be more willing to go to war. It’s one thing to lull an adversary into believing the mystique—it’s dangerous if the president believes it too. If that’s what has happened, someone needs to wake up the president.